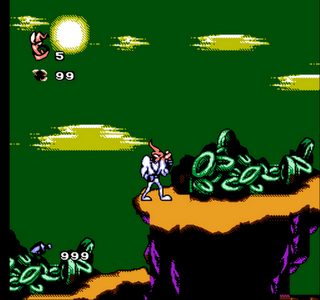 A bootleg game is a considered such if it is either a real game remade for another console not done by the developer. An example would be Halo for Atari 2600. Another example would be companies who put a bunch of real games on one CD or cartridge like the 23 in 1 Gameboy cartridge. The game’s music is just awful and deserves the mute button. This is what you can expect from a pirate though. This one is an original pirate that got hacked to different other franchises. 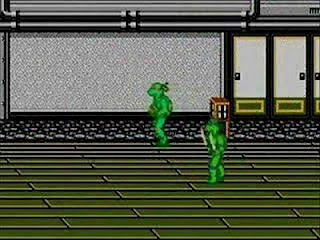 I’m sure there is a Mortal Kombat that is a clone of this game just with a different title screen and a better character select screen but I could be wrong. Overall, you will get a good laugh playing this game with a friend after a couple of beers. You can also pick this game up for a good price of around 5-10 usd so at least we can be happy it’s affordable. 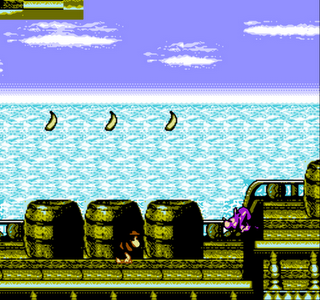 You play as Diddy Kong in the ship level but at the third and final level you’ll be the snake mutation of Diddy Kong. This one really creeps me out but being serious and all, it’s just the jumping snake you turn into in the game(Not sure what happened to riding the damn animals). The game does show signs of being incomplete especially since you can collect coins for the shop which you will never reach as the game only has three levels. You can also collect the 1-up balloons as well as the bananas. If you get hit once, you are a dead monkey so make sure you know the controls real well. The gameplay was done quite well and is very responsive. 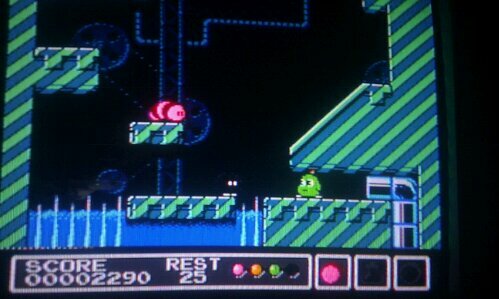 The level design is decent and does its best to mimic the SNES version. They even added the select button function to switch from your head whip to your gun since the NES/Famicom controller doesn’t have as many buttons as the SNES controller, now that’s impressive. The bosses are awfully easy so you’ll be able to get through with ease. The music is so-so as they tried to copy the SNES sound score although they felt short from making it successful, it was a good attempt nonetheless. You will be able to tell which song is which so no worries there. For 8-bit music, it’s what you get for it. There is also the super move that each turtle has. They are all the same and as effective so it doesn’t matter which turtle you use, you’ll be alright with either one. There is an added movement that will work on the pirate which helps you hit both ways with the super move. it’s quite easy to do if you are quick with the d-pad. All you have to do is perform the super move and then as you are doing the move you’ll need to tap the d-pad to the other side of where your turtle is facing resulting in the double super move! Things like this makes you wonder if pirates really intended to leave this bug in there or if they were too lazy to take it out but I think I’ll go with the first one as the game was hacked to aide you into finishing it without cursing and throwing the controller out the window. Pirates come in crappy shapes and sizes. From the Famicom to the Nintendo 64 (Believe it or not) But there are some that just seem to good to be true. 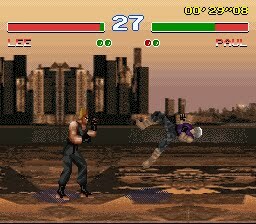 This is where Tekken 2 for the SNES comes in. Yes! You heard it! 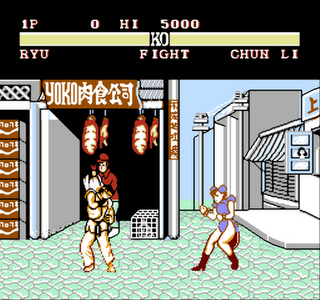 It’s Tekken for your 16-bit console. You might be getting all excited about this “gem” but it’s far from being a “gem”. The game is memorable in many ways and none of those ways are good. We are going to have a brief chat about Tekken 2 for the Super Nintendo Entertainment System.